HomeMaccaferri installs erosion protection works along river banks in India. 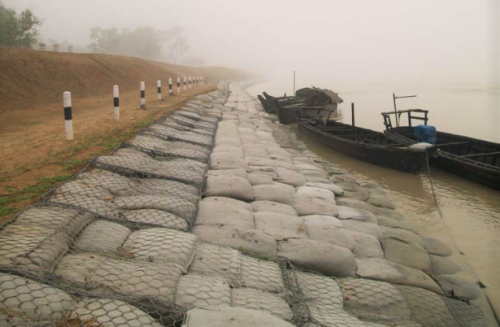 Maccaferri installs erosion protection works along river banks in India. Maccaferri India mitigates erosion damage through the use of several solutions: Gabion, Reno mattresses and MacBags. The protection of the environment has been a corporate goal since we first offered hydraulic works solutions and erosion protection solutions over 100 years ago. This application area involves protecting vulnerable soils, reducing erosion through stabilization. The Goda Park project and the Brahmaputra River project both qualify as erosion protection works. The Goda Park project involves the protection and lining of the river bank of the Godavri near to the Goda Park. The stabilization of the embankment on the left side of the river was thus suggested. The banks were subjected to erosion due to the flow of river water. The embankment had to be protected from instability at the toe caused by scouring. It was difficult to construct the rigid structure seeing as the existing clay soil was too soft. The surcharge slope on the embankment was 1:2. It needed protection against erosion. To resolve the issue a gabion wall for retaining earth was constructed. The main function of a bank protection structure was to provide a substantial interface between the water flow and the ground to be protected. As the founding soil was soft clay, the gabion retaining wall was the perfect solution for the proposed site due to its advantageous characteristics of the flexible woven double twisted steel wire mesh; the solution is defined by its cost effectiveness, flexibility, durability, drainage and permeability capacity and environmental compatibility. Also, the solution is easily installed. The top slope of the embankment was protected with a 0.3m thick Reno mattresses. For further technical information, please download our Case Study. The Brahmaputra Basin project focuses on the erosion control of the Brahmaputra channel belt. This belt is highly dynamic due to the incessant structural changes in the basin part and the basin margin areas as well as the sediment load dumping patterns. Rohmoria, in the upper reaches of the Brahmaputra River in Assam, is most severely affected by river erosion. The area has witnessed erosion for the last sixty years and more than 25 villages have been wiped out by erosion. To mitigate this problem, the Water Resource Department of Assam proposed bank protection works. The anti-erosion works are being implemented in a nine kilometer stretch along the Brahmaputra River from Bogoritolia to Kasuoni. The Water Resource Department suggested the use of MacBags for the bank protection, which is one of the most practical and viable solutions. Maccaferri MacBag TM is a geotextile bag filled with sand and commonly adopted for hydraulic protection works. These geotextile bags are produced from either woven or non-woven polypropylene geotextile or non-woven polyester geotextile. Thus, the bank and bed protection were carried out with MacBags placed on a geotextile filter layer. Peripheral strips of Steel Gabion and PP rope gabions filled with layers of geotextile bags were placed at regular intervals to impart further stability to the scour protection measure.